Morgan has been grieving the death of her grandfather for the past 11 months. 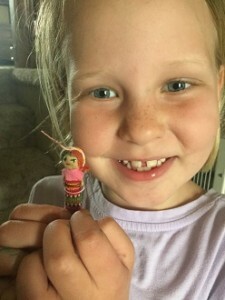 Heather McFall, our Assistant Director at our Bismarck office, gave Morgan a Worry Doll last May and has been carrying the doll everywhere she goes. She complains daily to her teacher, about her tummy hurting, and cries for Grandpa because she misses him so much. I explained to her how it works. She can squeeze it each time she wants to say her tummy hurts. So funny, but it seems to be helping her! The Guatemalan Worry Doll was made at our Mothers’ Club in Antigua, Guatemala, right in the sewing room at the Dreamer’s Center. The mothers do crafts and pick coffee beans to earn wages; the attendance of the Mothers’ Club meetings help them to understand the concept of earning a wage and how to manage their money as well as household chores and parenting. The Guatemalan Worry Doll is a way to let go of fears or worries so we can go forward in our day. Each night before bed you tell the little doll your worry and let it worry for you as you sleep deeply through the night. Some have many worries and so there are Worry Doll wreaths and even mirrors with the little dolls on the edges. It truly is a very effective way to tell your body that the worry no longer needs to continue. It comes from their Mayan culture. In the dolls’ original Guatemalan tradition, a local legend about the origin of the Muñeca quitapena, refers to a Mayan princess named Ixmucane. The princess received a special gift from the sun god which would allow her to solve any problem a human could worry about. 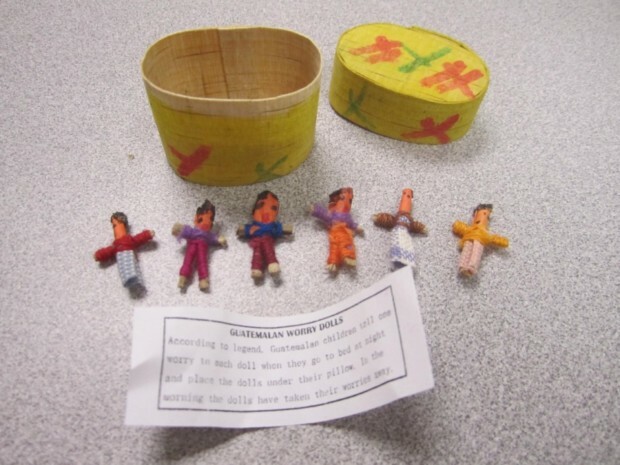 In tradition and in modern times, worry dolls are given or lent to brooding and sorrowful children. These would tell their doll about the sorrows, fears and worries, then hide it under their pillow during the night. After this, the child will literally sleep over the whole thing. At the next morning, all sorrows are said to have been taken away by the worry doll.